I had a hard time getting a shot that accurately shows the damage. The headlight and grill is displaced about 6 inches, and the side headlight fell off (I stuck it back on for the picture) The bumper is amazingly completely intact, and only slightly scratched. The hood peaks up about 4 inches. 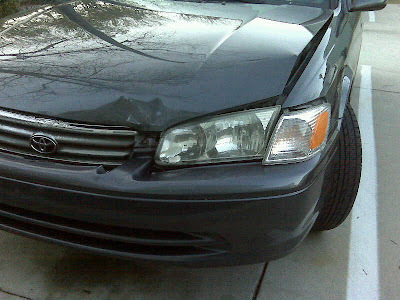 It could be a lot worse, but it’s still a bummer…a $500 deductible bummer.